Check out our new Performance and Accessories Inventory! Sullivan Auto Group is a family owned business. Since 1962, we've been buying and selling vehicles to dealers all over the country. Now we're bringing you the opportunity to buy quality vehicles directly from us at wholesale prices. Our financing plans are easy and available for anyone in any situation. For a quick and simple online application click here. Visit us today at our Elizabethtown location 719 East Dixie Avenue. Call our Elizabethtown location at 270-360-0020 and remember...Buy Your Car Where The Dealers Buy Theirs! 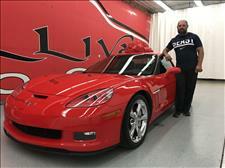 2010 Chevrolet Corvette Grand Sport LS3 with color matched custom LED lighting.